Tina graduated from Leeds with a degree in illustration and from Bretton Hall with a post graduate qualification in art education. Having lived in Yorkshire for almost 30 years and in Lincolnshire since 2008, her work is inspired by the ever evolving wolds and dramatic coastline of Yorkshire, Lincolnshire, Norfolk and further afield. 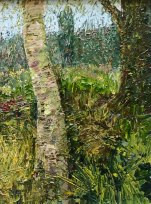 Tina often paints 'en plein air' capturing the moment in a contemporary impressionistic style, or from her Wolds' based studio referencing sketches made in the landscape. Tina is a member of 'Art on the Map' (Lincolnshire open studios), Lincolnshire Artist's Society, and the West Norfolk Arts Association.